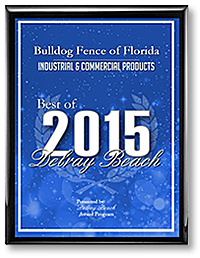 Bulldog Fence has provided over 63,000 South Florida residential and commercial clients with quality fencing over the last four decades. We work with a variety of fencing materials, including wood, aluminum, PVC, chain link, tennis court fences, pool safety fences, composite materials and split-rail equestrian fencing. Our designers, fabricators and 11 installation crews are trained, licensed professionals and our goal is to complete each project quickly, accurately and affordably. Our full-time sales and permit personnel ensure timely service. Whether you need a decorative custom fence, elaborate driveway gates or a secure chain link fence, Bulldog Fence can help you design, plan and execute your project to your complete satisfaction. We stand behind our projects, guaranteeing responsive follow-up services. Bulldog Fence is family owned and operated, and we pride ourselves on providing outstanding customer service to each of our clients. We provide a wide variety of quality fencing products to residences, developments and commercial businesses in Boynton Beach, Delray Beach, Boca Raton, Jupiter, Palm Beach Gardens, Wellington, Fort Lauderdale and Deerfield Beach, as well as other communities in Palm Beach, Martin and Broward Counties. Bulldog Fence is a proud provider of a variety of eco-friendly fencing options including Trex Fencing, PVC Fences and hand-built wood fencing to fit any property’s needs.